My response to that would be; if you have a guitar made for you, you’ll get an instrument that is perfectly set-up and easy to play. It will have good volume and a balanced tone and you will want to play it and hence improve. Even if you don’t play it as much as you would like, you’ll still have a beautiful object that was made for you. Another common comment is, “I don’t know much about how a guitar is made and wouldn’t know what to ask for.” Hey, that’s why you commission from a luthier, you get the advice you need. I’m just in the process of starting a new commission for a guy called Richard. I thought it would be useful to relay the story so far. Firstly, Richard knew that he wanted a steel-string guitar better than the ones that he already had, but was not 100% sure what he really wanted. So, I lent him one of mine, small bodied, 12 fret neck, wide fingerboard. Although I didn’t expect him to order an exact replica of this one, it was a starting point for the design process. He played it for a few weeks and what impressed him most was the quality of sound and craftsmanship. So he knows he wants one of mine. We discussed shapes, one thing that was important to Richard was how it felt, under his right arm when sitting down and playing. One problem that I have is that I don’t always have an example guitar around to show: I build the guitar, it goes off to its new owner. So, I made a full-size three dimensional model for him to try. He liked how it felt under his arm and how the waist locates the guitar on his leg (his dreadnought slips around). Shape decided. Next what are we going to make it from? 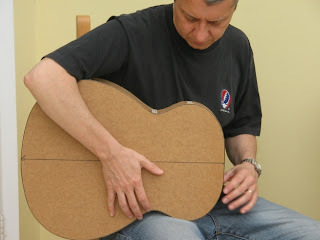 Richard liked the tone of the guitar I loaned him and said that he prefers a mellow tone, so I’m going to use the same materials, Western Red Cedar soundboard and Claro Walnut back and sides. I always buy too much wood, so over the years I’ve built up a good stock, this meant that Richard was then able to choose the back and side which he preferred. How cool is that! 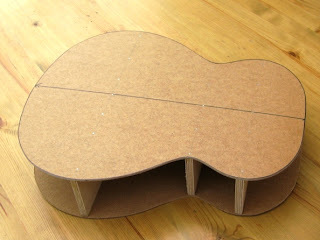 To be able select the pieces of wood that your guitar is made from? The head shape will be my standard shape and we’ve been discussing the veneer overlay. 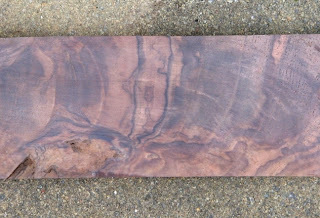 I’ve got some nice pieces of burr Claro Walnut that I hope to use on the head and also for a matching rosette. This week I’ll make up some samples for Richard to see; we’ve also got to discus details such as the purflings, width of fingerboard and inlays etc. Now, this all may seem a lot of work, but for many people commissioning a guitar is a once in a life-time experience, they’re spending a lot of hard-earned money on a luxury item and I want them to get it right!! im an electric guitar builder looking at building a first acoustic and i was wondering if you could answer a quick q. Does prufling have any point besides aesthetics or is it purely there for looks. It protects the end grain from damage too. i am a sucker for pretty wood.. the burrs especially and anything swirly or knotty. maybe that is a girly thing becaus i also love mother of pearl. i only have one hand made guitar.. a rawlings.. very pretty and plays lovely.